This Fall serve your guests this exclusive scallop recipe for a perfect wow. In a sauté pan, add extra-virgin olive oil and butter, shallots, onions and thyme. Cook until translucent. Add garlic, mushrooms and butternut squash and cook until tender over medium high heat, about 5-7 minutes. Deglaze with sherry vinegar. Evaporate the liquid and add the sugar and raisins . Sprinkle with chives, pinenuts and fetta cheese and serve under scallops. Season the scallops with salt and pepper. Heat a large sauté pan over medium high heat until hot. Add the oil, until hot. Add the scallops to pan. Cook the scallops without moving them on one side for 2-3 minutes. Don't turn over until you have a golden brown crust. Flip scallops and add butter and thyme sprig and cook for 2 minutes longer, basting frequently with the foaming butter. The scallops are done when they start to puff. Remove from the pan, blot on paper towels and place the atop of the butternut squash caponata. The recipe above is a variation of the traditional Caponata as it is made with Butternut squash. Caponata (eggplant) dish consisting of a cooked vegetable salad made from chopped fried eggplant and celery seasoned with sweetened vinegar, with capers in a sweet and sour sauce. Today, caponata is typically used as a side dish for fish dishes and sometimes as an appetizer, but since the 1700s it has also been used as a main course. Equally delicious using thyme instead of rosemary. 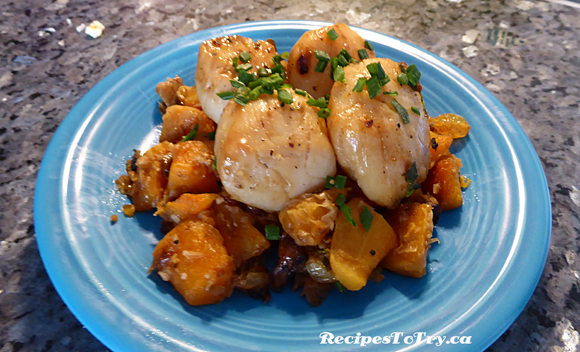 This link is to the Video made by Michael White on how to cook Truffle Scallops with butternut squash caponata It is a variation of the recipe above but will show you how to go about cooking this recipe.